It's coming. The big day approaches. 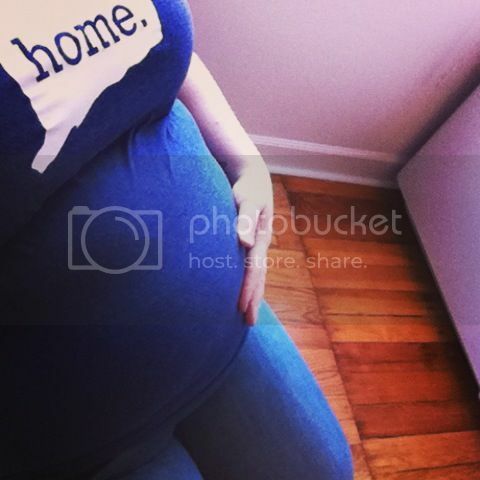 We're just shy of 35 weeks now, which means 2 weeks 'til full-term and 5 weeks 'til my due date. It's exciting, it's terrifying, and it's scary, and as much anxiety as I have over all of it, I'm also filled to the brim with hope and happiness and anticipation. I could go on for days about baby-related thoughts and worries, both positive and negative. But for now, I'll stick to the non-baby post-birth things. More than anything else during this pregnancy - more than cottage cheese, more than sushi, more than a nice piece of stinky French cheese - I've craved running. My last run was when I was about 10 weeks pregnant, a short one with Matt, where we made it about a mile before I told him to go on without me while I got sick to my stomach in a park. I have wished so often that I could lace up my running shoes and hit the sidewalks to pound out the stresses that have come with the pregnancy and everything that will follow. As much as I love walking, it simply isn't the same. Being drenched in sweat after a therapeutic run is as cathartic as the soreness in your throat after a much-needed cry. Still, I won't be able to start running immediately after Baby is born. There's my physical recovery, plus an incredibly needy small little baby who will need to be cared for. It's tough to accept, but I know that even though my due date is close, my running days are not necessarily so. I've thought so much about what it will be like to run again. How it will feel with a heavier, postpartum body. What my per-mile pace will be. How far I'll be able to run without stopping. I'm glad that I'm going into it with reasonable expectations, at least - I know I won't be beating, or even matching, my personal bests any time soon. That's not what this time will be about. I've thought about racing, too, and as tempting as it is to set goals (I've said so often to Matt, look at this race! Do you think I'll be ready to run X miles by X date? ), I'm holding off on registering for anything. Mainly, my idea is not to spend money on race registration if I am not yet sure what my body will be capable of. Beyoncé gained 57 pounds during her pregnancy and scheduled concerts three months later to ensure she stayed committed to getting her body back. I don't have the means to be a Beyoncé - nor do I even have the desire. As much as I want to wear my pre-pregnancy clothes, I also don't want to be so distracted during my baby's first few months that I don't stop and smell the roses. My baby will only be a baby for so long, and having those days with him are more important to me than having a smaller number on the tag in my pants. It's nice, though, to daydream about the races. It reminds me a lot of being at my biggest, and of the days before starting Couch to 5K. I gave quite a bit of thought to my races - in particular, what my first one would be. It would be meaningful, no doubt, and it was: a small 5K near my hometown in Connecticut, with all my family waiting at the finish line. I've been giving the same consideration to my first race post-baby. I have all the newbie butterflies - it's like being a virgin to racing all over again. How exciting, thinking about what race it'll be, fantasizing about my beloved and our little boy waiting for me at the finish, and already anticipating the tears. This is such an exciting time! I am so happy for you! Your focus is in the right place! Wonderful post! I cannot express to you how much I relate to you and the things you write! I found out I am having a boy as well:) I cannot wait to be able to run again. Everyday I think "I think I feel like I have the umph to run today" but then I try and I do not have that umph:( it stinks but itll come back and Im trying to keep telling myself that it will! So happy for you cant wait to read about your first post babmbino race! Youll rock it! Congratulations! Sending lots of good thoughts as you approach the big day! Everything will fall into place soon enough. I can imagine you're just itching to get out there! I'm sure you'll blink and all of a sudden your son will be 6 weeks old and you'll be lacing up your shoes for the first time in a long time. It'll be here before you know it, and I'm sure you'll find a whole new love for running again!! I can't believe you only have 5 weeks left!! Wow, the day is getting close! Baby and running will be here before you know it. Take care. You look beautiful! What does your shirt say?